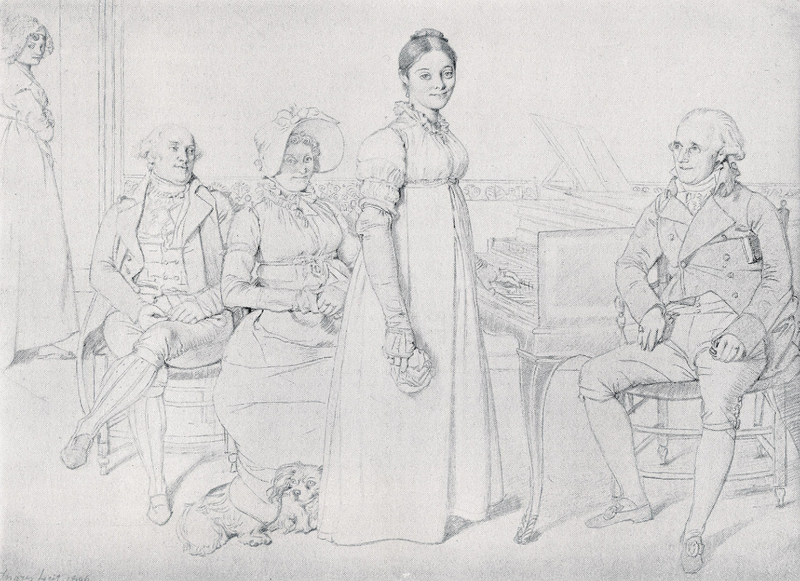 Julie Forestier, Ingres' fiancé, stands at the keyboard surrounded by her family in this well-known drawing. 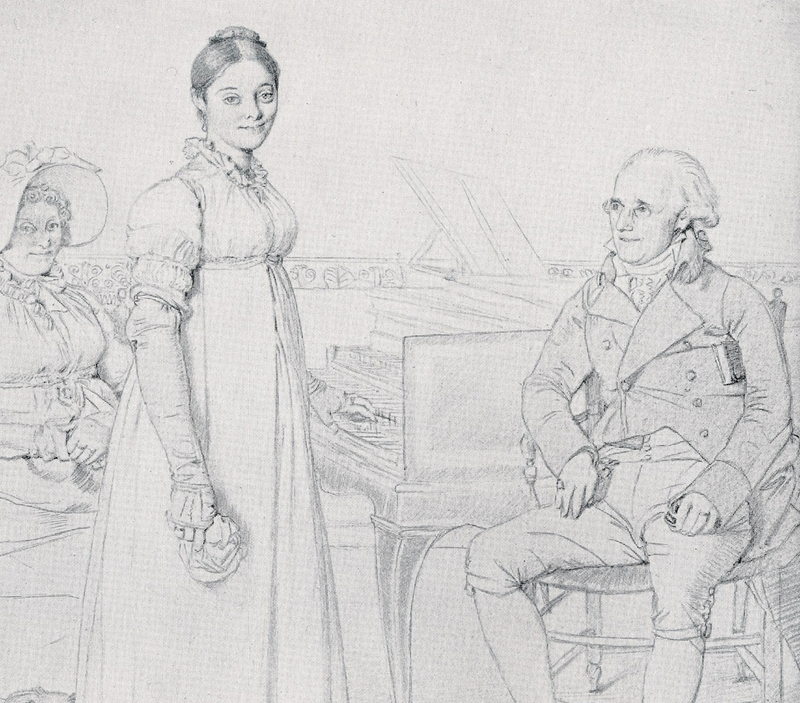 She was a painter too and shared a love of music with the master. 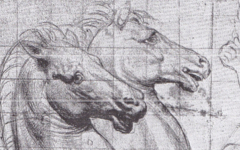 Ingres' draughtsmanship is so precise that his "errors" here have been missed. Yet once seen, they are substantial. As regular users know though, one of our principles is that great masters do not make mistakes; only we do in viewing their work. Intentional inconsistencies are often the result of fusing two "scenes" into one and so become clues to the meaning. Here Julie's arm casts a well-defined shadow on her dress all down its length. It appears as though the light itself comes from directly behind us, almost as if horizontally through a studio window. This light, though, does not reach the side of her father's face or even the top half of her mother's. There seem to be two entirely different light sources as there is, for instance, in Manet's Le Déjeuner sur l'Herbe (1863), that too previously unseen. Just as surprisingly, even though Ingres' is known for his anatomical distortions, Julie's arm is far too long, the same length as her leg. Arms are rarely ever that long. The next important feature is Julie's handkerchief, clearly reminiscent of Ingres' own white cloth in an 1804 Self-portrait. (Julie herself painted the copy at left of which the original is now lost.) As I showed in an entry on Roy Lichtenstein, a white cloth has been a common feature in artists' self-portraits since the Renaissance. They use it to wipe off paint, smudge it or rub it in. L: Julie Forestier, Copy after Ingres, 1804 Self-portrait (1807) Oil on canvas. Private Collection. How to resolve these issues? The only way I can see is to assume Julie's arm is out of proportion and shaded the way it is because it "hovers" above the surface of the drawing. She is "drawing" the image we see. The shadow is on the paper and not her dress. The light elsewhere comes from a different source which is why those faces are lit differently. 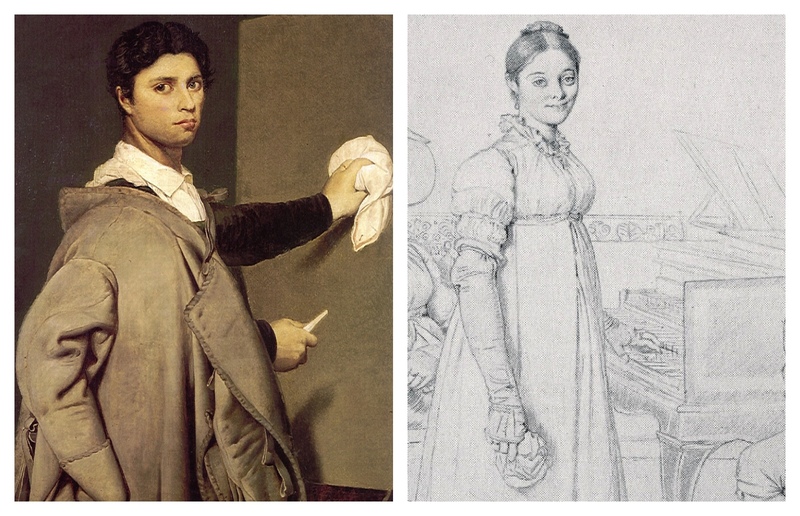 This explains, too, why both Julie and Ingres hold white fabric in their portrait and self-portrait. Besides, her other arm touches the keyboard, part of a long tradition in which a musician becomes an alter ego for the painter "painting". And, as his fiancé, Julie represents the androgyny of his creative mind. 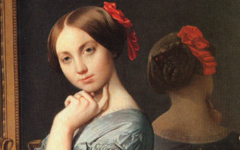 Not surprisingly, Ingres has made Julie's eyes his own. He did the same with the eyes of her faithful dog and, no doubt devoted to his fiancé, "becomes" her dog. Then, again, Ingres would have known how many artists from at least Titian onwards had done something similar, representing themselves as their sitter's dog to suggest, through pose and/or features, that the dog had "painted" the portrait, their fur a tactile reference to the hairs of a paintbrush. 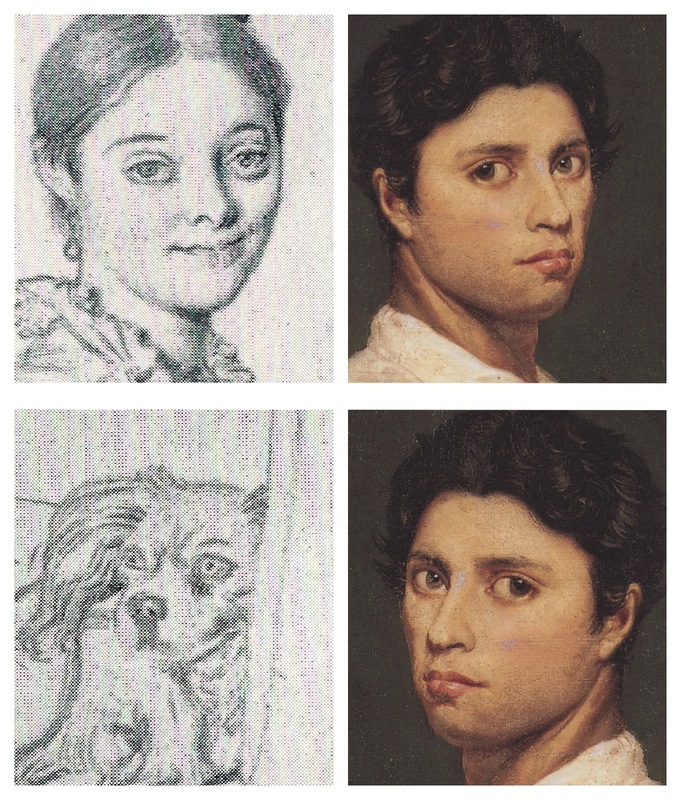 Here, the shape and angle of the dog's eyes and her own are so similar to Ingres' in the Self-portrait Julie later copied that there can be no doubt: Ingres is both Julie and the dog, and its fluffy tail a "paintbrush" (lower left). 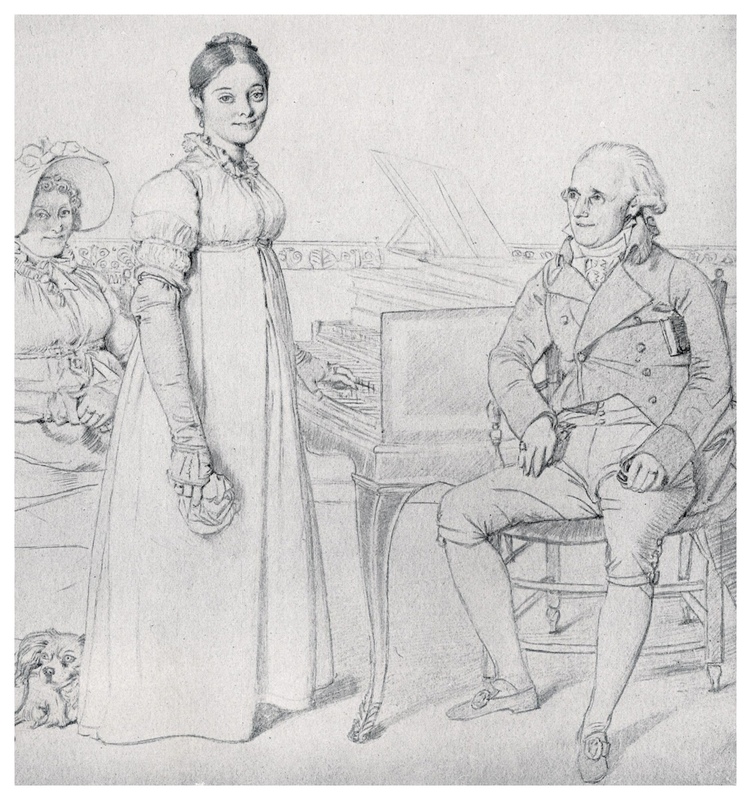 In The Forestier Family Ingres depicts his mind in the process of creating The Forestier Family. Original Publication Date on EPPH: 10 Mar 2013. © Simon Abrahams. Articles on this site are the copyright of Simon Abrahams. To use copyrighted material in print or other media for purposes beyond 'fair use', you must obtain permission from the copyright owner. Websites may link to this page without permission (please do) but may not reproduce the material on their own site without crediting Simon Abrahams and EPPH.